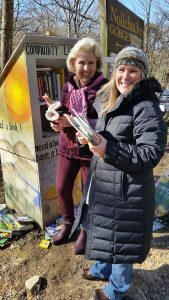 There were so many incredible MLK Day of Service projects last week that we had to dedicate another Volunteers in Action post to feature more. The GFWC Grundy Center Woman’s Club (Iowa) invited a local 4-H Club led by a club member to join them in making basic bags to be given to their local domestic violence/abuse and sexual assault agency, Crisis Intervention Services. Fifteen 4-H kids attended the event. 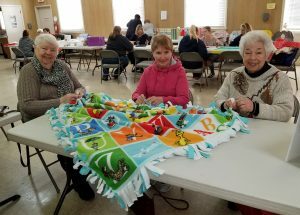 Sixteen clubwomen from the GFWC Rhinelander Woman’s Club (Wisconsin) braved sub-zero temperatures to make no-sew blankets for Operation Smile, completing 23 with a few more that clubwomen took home to finish. Everyone had a good time chatting, being together, and serving the greater good. 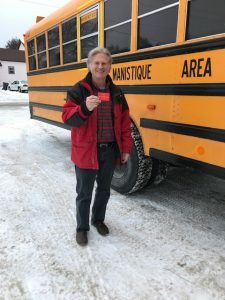 The GFWC Manistique (Michigan) gave $5 gift certificates to all bus drivers, maintenance workers, and janitors at the local schools to tell them how appreciated they are! 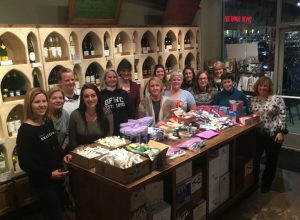 The Woman’s Club of Loudon (Virginia) adopted March of Dimes’ new self-care kit project. They completed 102 kits in one night! The project was a hit and simple to complete. 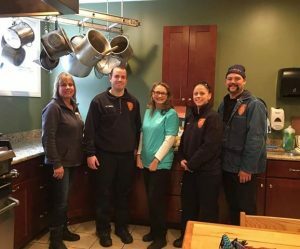 The GFWC Auburn Junior Woman’s Club (Massachusetts) delivered food to the Auburn Mass Fire Department and the Auburn Police Department. Both establishments were extremely thankful to be thought of by the club on the day of service. Later that night the club attached tags that said, “Take me if you need me. What happens to you, matters to us,” in English and Spanish to hats, mittens, scarves, and blankets as part of our Warm Hands, Warm Hearts Project. Volunteers braved the cold last night to distribute these items downtown. 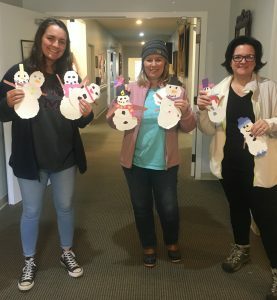 The Batesville Junior Woman’s League (Mississippi) began their MLK Day of Service at the assisted living home, conversing the residents and putting up handmade snowmen on all of their doors. They also dropped by the fire station with fruit and muffins for the firefighters on duty as a little thank you for all they do for the community. Their last project was Pick up Panola. Trash has become a sore spot in their community, so they spent the next few hours picking up trash in three different areas of the county. 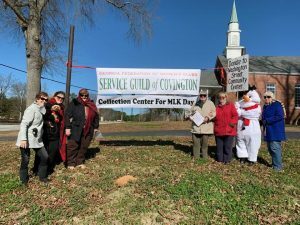 The GFWC Service Guild of Covington (Georgia) collected “the Wish List” from Washington Street Community Center. Frosty the Snowman garnered the attention of passerby, while members collected sporting equipment, art supplies, board games, money donations and more! It took two large SUVs to load all the donations! L to R: Service Guild members Lynn Garrett, Pam Barnes, Diane Loeble, Peggy Hawley, Betty McFadden, Frosty (Kathy Rhoades), and Marianne. 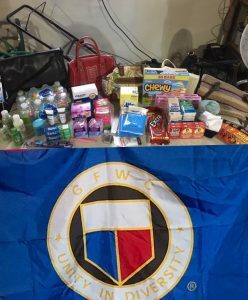 The GFWC Seward Woman’s Club (Nebraska) donated gently used purses and items to fill them, including bottled water, tissues, feminine products, shampoo, lotion, wet wipes, gum, raisins, granola bars, toothbrushes and toothpaste, Band-Aids, socks, mittens, and hand warmers. 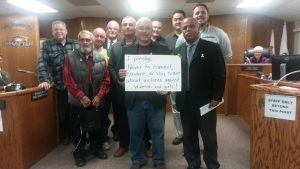 The club had read that a purse is one of those private things that a woman has just for her, and many times that is lost or set aside during homelessness. They handed the purses out to homeless women because to have that small gift with needed items helps them claim a piece of themselves often lost during their journey. 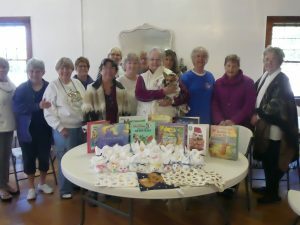 The GFWC High Springs New Century Woman’s Club’s (Florida) project was “Bunnies, Books, and Bandages.” They collected children’s books to be donated to two local daycare centers and created bunnies out of washcloths for the children to read to. They also sewed Operation Smile bandages, which are splints used to prevent children from bending their arms after receiving facial surgery. 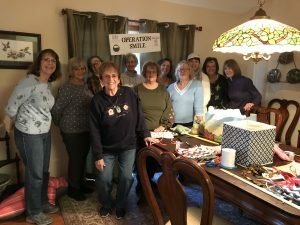 The GFWC Tellico Village (Tennessee) held a sewing bee for Operation Smile. A group of 15 ladies cut and knotted blankets, stuffed dolls, and sewed arm bands for Operation Smile patients. 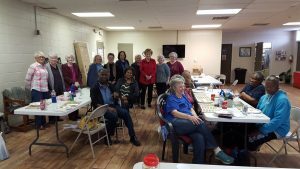 The Dequincy Study Club (Louisiana) provided the Dequincy Senior Center with refreshments, bingo prizes, and lunch to the appreciation of the seniors! Thirteen members (and one granddaughter) of the GFWC Greater West Palm Beach Women’s Club (Florida) donated cat and dog food, litter, toys, blankets and sheets to the Peggy Adams Animal Rescue League. They also toured the facility and learned that they offer portable vaccine clinic for the community, do 60 planned surgeries per day, and have a nursery to bottle-feed. 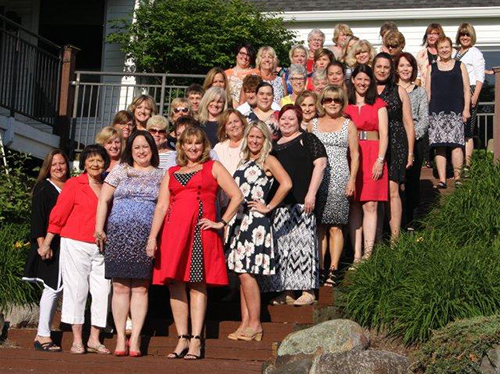 The 141 volunteers and staff are 80 percent women, and greeted the club with a smile during their hour tour. 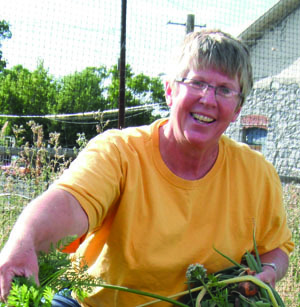 Check back next week for our final round of MLK Day of Service success stories!